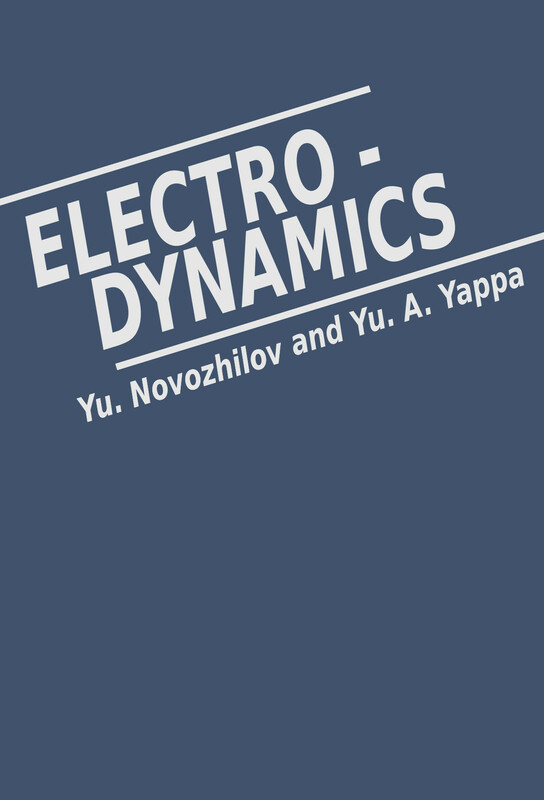 In this post we will see Electrodynamics by Yu. V. Novozhilov and Yu. A. Yappa. This book originated from our experience in teaching electrodynamics as part of a series of lectures in theoretical physics. The lectures were read at the Leningrad State University for all students of the physics faculty, both future theoreticians and experimenters. The subject matter follows from what the students learned about electricity and magnetism in the general physics course, On the other hand, an electrodynamics course must serve as the basis for many special disciplines, such as plasma physics, propagation of radio-waves, electromagnetic methods in geophysics, the accelerator theory, and others. These factors have determined the content of this book and the manner of presentation. In accordance with the purpose of this book, we assume that the mathematical grounding corresponds to that of a student who has completed his second year in the physics faculty of a university. This should be sufficient to understand all of the material of the book. The Appendices contain the basic facts about vector and tensor analyses, which are used throughout the book, and also some properties of the Dirac delta function. Particular attention is paid to the application of the special theory of relativity, In Chapter 2 we briefly consider the fundamentals of special relativity, while in other sections of the book we apply this theory to specific problems. Notably, the relativistic theory of radiation by a point charge is treated in great detail. The reader more interested in non-relativistic aspects of electrodynamics can skip these sections, which are marked with asterisks. To keep the size of the book within limits we have found it necessary to exclude the specific problems of mathematical physics that originate in electrodynamics. For the same reason the book contains no exercises. The reader can find appropriate problems on classical electrodynamics in the well-known book by V. V. Batygin and I. N. Toptygin: Problems in Electrodynamics (2nd edition, Academic Press, New York, 1978). We should also like to note that the presentation is concise and hence the material requires attentive reading. The reader is advised to do all the intermediate calculations himself. In style and subject matter this book reflects the pedagogical principles of our teacher, Academician Vladimir A. Fock, to whom it is dedicated. The book was translated from the Russian by V. I. Kisin and was first published by Mir Publishers in 1981, and was reprinted in 1986. You can get the book here and here. Note: IA parameters may be different. § 33. Magnetic energy and forces in a system of direct-current loops. This entry was posted in books, mathematics, mir books, mir publishers, physics, science and tagged absorption, boundary value problems, current, dielectrics, electrodynamics, electromagnetic field, isotropic media, lorentz-dirac equation, mathematics, maxwells's equations, MHD, mir books, noether's theorem, potential function, radiation thermodynamics, relativistic electrodynamics, scattering, special relativity, wave equations. Bookmark the permalink.